"Lemon" cake pops... made these today for a gathering later this afternoon... since my freezer is full, had to cool them "outside" for 15 minutes before dipping. Am happy with my "first try." Daughter Alicia is the expert at this. I didn't even have any "sprinkles" in the house! To make 18 pops - takes a 1/2 sheet of 9x13 cake, crumbled; about 6 oz of frosting to hold the cake pop balls together, cool; then I used one package of dark chocolate chips for dipping. AOK! You're lucky that no 'critters' came to help themselves to the goodies in your outdoor fridge! They look really yummy Karen. P.S. Your Lacebook entry is gorgeous! Such a beautiful way to capture sweet memories and sentiments. I was just imagining a blue canadian moose coming along for a treat!! I've always wanted to try making cake pops but somehow haven't managed yet. They look wonderful. 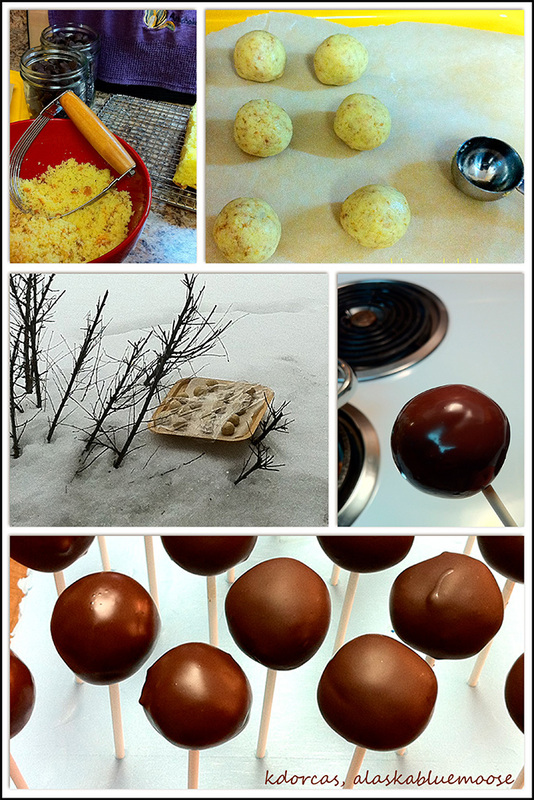 I've never tried making cake pops, I think I will in the near future now. CHEERS! I've made strawberry jam in the garden by means of the hot sun when we had a very hot summer, along the lines of a Joy of Cooking recipe. Making chocolates in the snow is even more exciting.